Balancing Jane: New Report on Interracial Marriage in the U.S.
Interracial marriages are on the rise. About 15% of new marriages are between people who identify as different races, compared to 6.7% in 1980. On the surface, people who "marry out" have similar educational and economic attainment as those who "marry in," but differences arise when looking at the racial identification of the pairings (for instance, a white/Asian couple has a higher median income ($70,952) than a white/white couple ($60,000) or an Asian/Asian couple ($62,000). The part that was most interesting to me was the Public Opinion section. 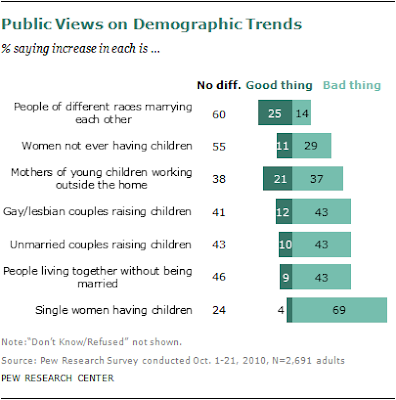 "Nearly six-in-ten liberals (59%) think that more people of different races marrying each other has been a better change for our society, nearly half (48%) of moderates agree, compared with less than one-third (32%) of conservatives who say so." Of the questions designed to gauge public opinion on the impact of social decisions on the larger society, interracial dating is viewed favorable by the most people and unfavorable by the least people. 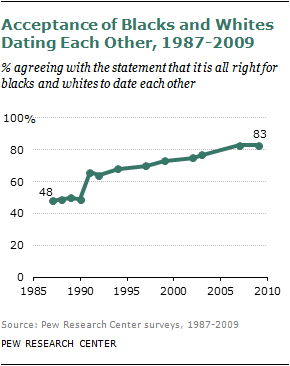 The percentage of people who say that interracial marriage is acceptable is at an all-time high (83%). Among adults ages 18-29, that rate is 93%. It is lowest among adults 65 and older (67%). Does anyone know what caused the huge jump from 1990 to 1991? I'm really curious. The saddest finding was the prejudice within subcategories of some of the findings. I was especially frustrated--though not particularly surprised--to see that people were more willing to accept their family member dating someone who was Asian or Hispanic than they were to see their family member dating someone who was black. Also, since these items were not asked of people who were of that particular race, these responses demonstrate that people of color are more likely to accept interracial marriage of their group members with white people than the other way around. As this question posed to Yo, Is This Racist? points out, perhaps the saddest part is that this is an issue that need to be polled in the first place.